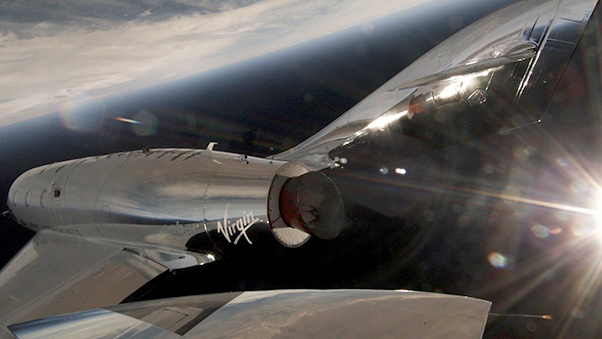 Virgin Galactic announced a major step forward April 5 when SpacShipTwo VSS Unity safely and successfully completed her first supersonic, rocket-powered flight. After two years of extensive ground and atmospheric testing, the passing of this milestone marks the start of the final portion of Unity’s flight test program. The flight was also significant for Virgin Galactic’s Mojave, Calif., based, sister manufacturing organization, The Spaceship Company. Unity is the first vehicle to be built from scratch for Virgin Galactic by The Spaceship Company’s talented team of aerospace engineers and technicians. They were justifiably proud today to be a part of this compelling demonstration of their capabilities in action. VSS Unity benefits from all the data and lessons gathered from the test program of her predecessor vehicle, VSS Enterprise. The April 5 flight saw an envelope expansion for the program as a whole in terms of rocket burn duration, speed and altitude achieved. VSS Unity took off this morning into clear Mojave skies at 8:02 a.m. with Mark “Forger” Stucky and Dave Mackay in the cockpit, attached to the WhiteKnightTwo carrier aircraft, VMS Eve, piloted today by Mike Masucci and Nicola Pecile. The mated vehicles climbed to a launch altitude of around 46,500 feet over the Sierra Nevada Mountains and, while pointing back at Mojave, Eve executed a clean release of Unity. After a few seconds, Unity’s rocket motor was brought to life and the pilots aimed the spaceship upwards into an 80 degree climb, accelerating to Mach 1.87 during the 30 seconds of rocket burn. The hybrid (nitrous oxide / HTPB compound) rocket motor, which was designed, built and tested by The Spaceship Company, powered Unity today through the transonic range and into supersonic flight for the first time. On rocket shutdown, Unity continued an upwards coast to an apogee of 84,271 feet before readying for the downhill return. At this stage, the pilots raised the vehicle’s tail booms to a 60 degree angle to the fuselage, into the “feathered” configuration. This unique design feature, which is key to a reliable and repeatable re-entry capability for a winged vehicle, incorporates the additional safety mechanisms adopted after the 2014 VSS Enterprise test flight accident. The flight has generated valuable data on flight, motor and vehicle performance which our engineers will be reviewing. It also marks a key moment for the test flight program, now entering the phase of powered flight and the expansion to full duration rocket burns. “While we celebrate that achievement, the team remains focused on the challenging tasks which still lie ahead,” said a Virgin Galactic spokesperson. “Congratulations to our teams at Virgin Galactic and The Spaceship Company for a job well done today — and in recognition of their pursuit to open space and change the world for good,” the spokesperson continued.